Not only has recent market volatility resulted in renewed anxiety for many investors, it has also been a stern reminder of the value of having a proper mix of assets in your portfolio. The concepts of asset allocation and diversification can be traced all the way back to a 4th century text, the Babylonian Talmud, which said, “One should always divide his wealth into three parts: a third in land, a third in merchandise, and a third ready to hand.” While this may have been sound advice at the time, many of today’s asset allocation decisions are based on a doctoral thesis written by a University of Chicago economics student in 1952. The essay, titled “Portfolio Selection,” was written by Harry Markowitz and is considered by many the Holy Grail of investing. 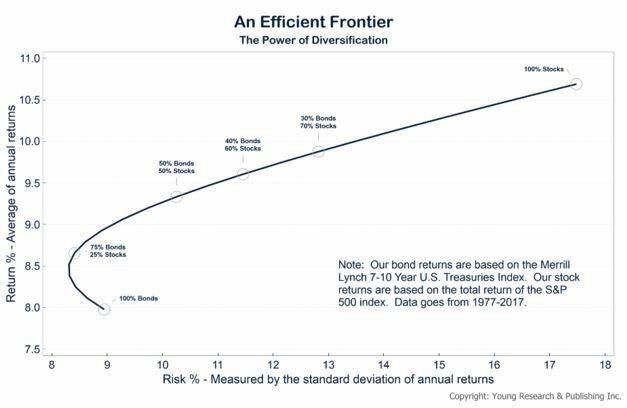 In his thesis, Markowitz introduces Modern Portfolio Theory, the idea of an optimal “efficient frontier” where a set of portfolios provide a maximum return for a given level of risk. In theory, these “optimal” portfolios are created by diversifying investments across a broad range of asset classes whose returns are not correlated, therefore reducing overall volatility. Another important aspect of asset allocation is that it helps investors keep a long-term perspective and avoid making decisions based on emotion. Investors tend to chase performance by abandoning poor performing sectors in search of greener pastures. This attempt at market timing has led to very poor long-term performance for the average investor (see graph below). 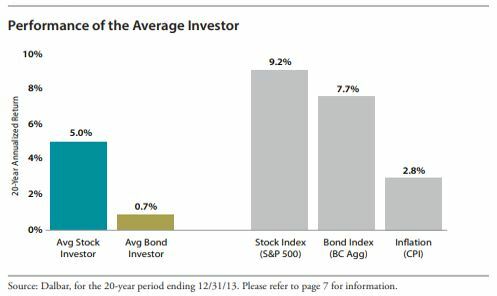 Once we’ve tackled the big picture of asset allocation, it’s time to further diversify the portfolio. 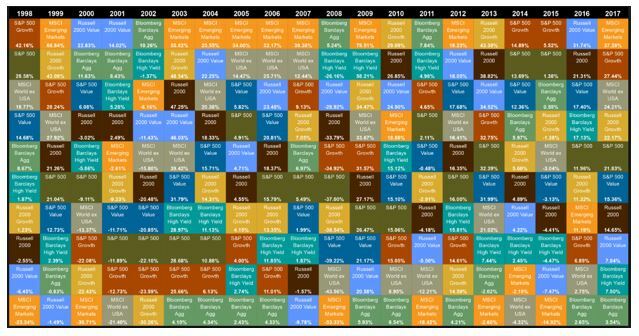 The value of investing in different asset classes can be seen through the randomness of returns on the “Periodic Table of Investment Returns” below. The fact is no one knows with certainty in any given year which sectors of the market will be winners and which will be losers. What we do know is that investing in several different non-correlated asset classes can help reduce portfolio risk and provide a smoother ride for investors over the long-term. Although there are many critics of Harry Markowitz and Modern Portfolio Theory, there is plenty of research backing his thesis that asset allocation and diversification are two essential strategies for building a sound portfolio. Please don’t lose sight of this…finding the right allocation for your investments is not a one-size-fits-all approach yet should be tailored to your particular situation.